Wear eye protection, it only takes a twig or thorn to lose an eye. Off-road mudguards/ Crud Catchers are a good idea in mucky weather. Bring a bare minimum emergency tool kit, a spare inner tube and a bike lock for outside the pub. DON'T TRASH OUR PLANET Leave it the way you would like to find it, so don't pollute, scar or damage the Great Outdoors. Be friendly to other countryside users, slow down, say Good Morning/Afternoon and smile a lot. I do not have any bright lights - do I need some? - Visit our Forum and ask to borrow some for your first ride with us. You will need to bring some basic lights to ride home from the pub via the road so you can give the lights back to the lender. Where can I get some decent lights? - There are many options starting from about £20 on eBay or Amazon. 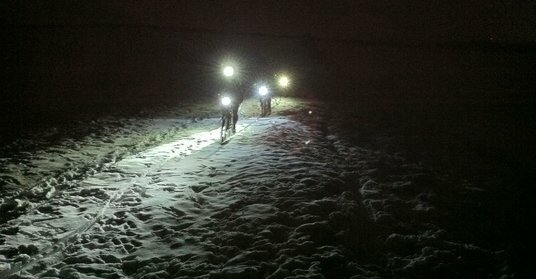 Generally, you need to be looking at off-road lights above 800 lumens with a battery life of over 3 hours. Ask on the Forum for advice and be clear at the start regarding your budget. A good review of 2015 / 2016 lights can be found hear. Popular lights with the regulars/old lags are Lumicycle or Light & Motion HIDs, Ayup twin LED sets, Exposure LEDs or the Cateye Double/Tripleshots. Double combos of a handlebar and helmet mount are good, but not essential. The vast majority of our rides are in darkness and as it's mainly off road the lights must be reliable and designed for that sort of use. This is mainly for your safety and that of your fellow riders. While we do ride some sections on the road, we go offroad, in the woods, and on sections where the surface is hard to see and you need a very good light to reveal the potholes, divots, gaping holes, branches, logs and dog-eggs. don't forget a back light too and if it's one of the eye-searingly bright ones, it's courteous to put it on continuous or wandering, rather than flashing so you don't blind the rider behind you. What age limits do you have? - We do not have any official age limits but generally under 16's may find it too hard going. We would recommend that any under 18's need to be accompanied and be reasonably fit. We do have some regular "senior" participants (!) but, again, you need to have a reasonable level of fitness. ​What about the weather? 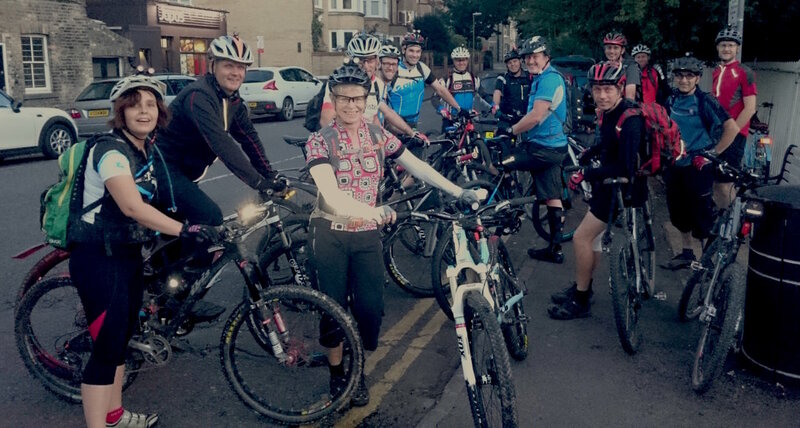 - Some of our riders come out in all weathers but check on the Forum to see if anyone is coming out if the weather looks bad.